For those of us who grew up in the '80s there are certain roles that will stick with us forever. 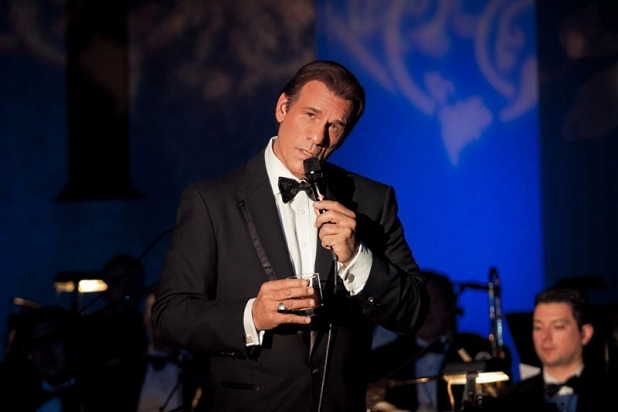 Today we're talking with Robert Davi, who's impressive resume includes movies such as The Goonies (Jake Fratelli), Die Hard (FBI Agent Big Johnson), and License To Kill (Franz Sanchez), the TV show Profiler, and over 100 other titles on IMDB. Now he's coming back to his first love, singing, and I caught up with him to talk about his debut album, why the American Songbook is important, and his favorite roles. 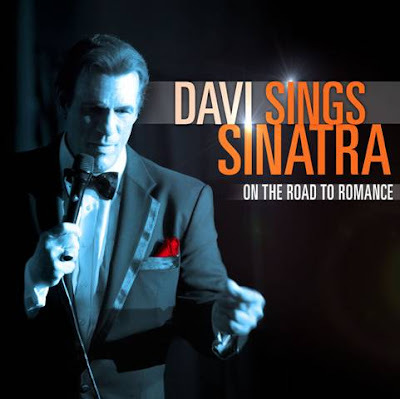 The album is called Davi Sings Sinatra: On The Road To Romance. It comes out Monday. I'm just terribly excited about it. It was produced by the legendary Phil Ramone, mixed by Al Schmitt, recorded by Danny Wallin, top of the field at Capitol Records when Sinatra recorded a lot of his music from '53 to '61, his Capitol years. Just a thrilling experience. Singing was my first love. If you'd asked any of my family members, they would've said, "He's gonna be a singer." I studied opera in Florence, studied at Julliard, and here I am about to release my first record. I did my first film with Sinatra in 1977. You expected to have a singing career and I heard you damaged your voice, then you shared the screen with Sinatra. Did it have an effect or shape your career? In an Italian household, there are two figures: the Pope and Sinatra. And not necessarily in that order. He was already a figure because culturally and socially he was so relevant. He was one of the great figures of entertainment, a great actor and amazing singer. I already had a huge respect for him and the music, which I used to sing. Now you do your first picture with him, was just amazing. Were you a little starstruck when you met him? The first time was when I auditioned for the part. He also produced the picture. That was a roomful of people and I was more intent on communicating my ideas in the character at that moment. The second time was when we were on the set and I had already shot a couple scenes. He showed up on the set for the first time and I was in this big truck and he pointed to me and said, "[Saw] the shot the other day. It's terrific. You're terrific." And he remained a friend and was very friendly over the years. The first time I saw him live was when he brought me to a concert in New York at Forest Hills while we were shooting Cherry Street. He brought six of us to the concert. That was an incredible experience. He was a marvelous voice that night. To see him perform in such exquisite vocal shape was an absolute tremendous experience. So is that why you decided to cover Sinatra instead of doing original tunes on your first album? Two things: the Sinatra songbook, he didn't really write the songbook. He sang the songs. The songbook was written by these brilliant artists. He interpreted them. What made me want to sing right now was two basic things which are bursting out of me, it's something larger than myself that's driving me to do this. 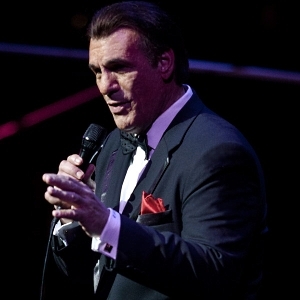 It wasn't just Robert Davi loves singing. The American songbook is the golden age of American music. It's the Shakespeare of America. It's what made the world fall in love with our country and the greatest interpreter of that was Sinatra. For his time, he was the first artist that went against racial bigotry and Antisemitism. He brought the country together. He made the world fall in love with America. And for me, this particular time in our history we're going through a pretty rough divisive time. I entitled it On The Road To Romance. It wasn't just the aspects of romance: the seduction, the falling in love, the depths of love, the falling out of love, the despair of love, and now the elation of finding one's self. It's also our romance with our country, with America. No matter how difficult a time, America comes through. America is a great country. The ideal of America is tremendous. Sometimes the people's decisions might be different, but the ideal is one full of optimism and hope and that's what this music pervades. That's my message and why I needed to start singing, to pull us together. When I do my live performances, I'm getting a tremendous response because I also speak a little bit about the American songbook and how the black jazz junk blues artists [were] creating a sound and you have these sons and daughters of Jewish immigrants that helped write the American songbook. It was very interesting. If you had no Jews, you wouldn't have the American songbook. It came out of the cohesive struggle of the black and Jewish immigrant community and American people. You needed the Italians for singing. When you think about "All The Way," the lyric that won the Oscar in 1958, and something that won the Oscar a couple of years ago, "It's Hard Out There For A Pimp," it kind of puts us exactly where we're at. This music is classical. It's timeless. At my concerts, you're having ten-year-old kids and you're having grandparents being able to join together and enjoy the music. You can't say that about all the music today. And that's the big difference and that's my need to kind of say, "Let's bring us all together." I did a concert the other night: people from France, from Russia, from Korea. A young twenty-year-old girl from Korea bought ten albums at the concert. It translates to everything. It's inspiring the way you're talking about it and I can tell you're inspired by that songbook as well. So it must feel great to get back to singing after so long. Did you expect your acting career would take off the way it did? You always feel there's a sense of destiny, you know what I mean? I always felt I was fulfilling what I was supposed to do because to be able to sing is a different aspect of who you are, not everybody can sing. Everybody can enjoy singing, but not everybody can communicate through song. So there was an aspect of myself that I was burying and this has now just exploded out. I was listening to your album. You have such a rich voice and it's so authentic. You're really interpreting it and making it your own and I love that. When I was listening to it, I was thinking my mother-in-law's going to go nuts because she was also raised on this music and loves it. I think I may have to buy your album as a Christmas gift. You said you never felt more alive. What's it like to make an album after doing so many years in movies and TV. Is there a lot of similarities or is it a completely different experience to make an album? Well, let's put it this way: I was doing films for so many year and theater also so I was adept at live performance. So now, to be able to go into a recording studio with thirty musicians and you have a three to four minute song, it's like that time period where there it is, it starts and you go. You're using all of yourself. A great composer said one time, and I'm paraphrasing, "Music is the closest we get to the absolute." You feel like something is flowing through you. You're open; your heart is open. Not to get New Age, but your chakras are open. It's a real spiritual thing that takes over with the music and it pours through other musicians playing and you and the audience and the microphone. It's non-fatiguing. You feel inspiration and it was just so exciting. Since you have acted and directed and now sing, which one do you love the most? I know that's a hard question. Parts of all of them. There's a fulfilling aspect of all of it. With the directing, you get the totality of vision. The same thing with the song. Each song is a little film. Each song is a little character. I'm so excited about the singing. When I talk about the need for this cohesive songbook and the message I want to say through it to the whole country, that's the motivating factor for me. Right now I have an overwhelming need for this. That's wonderful! I've been hearing good things about your live show. Any tidbits or stories you want to share about being on the road? It's so exciting. I can say the response has just been tremendous. I love it. I just absolutely love it. Emil Richards joined us a few months ago. He toured with Sinatra and played with him from the recording studio to world tours, from 1959 to '74. He's one of the greatest live players in the world with the largest percussion collection. People don't know him maybe by name, but he's known in the music world. Players like that who have played with Mr. Sinatra and guys who are still around have heard me and it's humbling what they're saying when they're playing with me. On our site, we do a lot about the '80s and I did want to ask you a little bit about some of your roles. You had some iconic roles, especially in the '80s. What were some of your standout favorites? You've got The Goonies. You've got Die Hard. You've got at the very end of the '80s, Bond. In between that, there was Raw Deal with Schwarzenegge, but Goonies was a classic. What's fun to me with that and Die Hard and Bond is because of the pop cultural aspects of those films, a lot of younger people maybe wouldn't have normally gone to a concert of the great American songbook, they remember Jake Fratelli singing opera. They come and they're enjoying that. My favorite scene in The Goonies was one with you. Of course I enjoyed your singing, but there's this whole scene where you're questioning Chunk and he's talking about being in the movie theater. And you start laughing and you go, "I like this kid" and that always makes me laugh every time. A lot of that with the Fratellis was improvised. I improvised the whole opera singing. That was not written into the script. I showed Richard Donner, you know when I have to feed Sloth? When he's in the basement? It was written that I just put the food dish out of reach and every time he goes to reach it I would move it away a little further. I'd taunt him with it. It was very sadistic. I'm like, "What if Jake wants to be a singer and the mother doesn't listen to him, the other brother doesn't listen to him, and the only time he gets to sing is in the basement when he feeds his brother because he has to listen to him to eat? And this particular time, he doesn't listen to him and I can throw the food at him?" And he said, "Let's see what you're going to do." And then I told Anne Ramsey to slap me every time I do something. Just haul off and slap me because when you're doing a film with all these kids, I wanted to be not only a bad guy but a kid that related to them. So at that moment, "I'm beginning to like this kid," that's what gave me the key. That line was in the script. That said to me, "OK. The writer, whether he intended or not, Chris Columbus, that let me say I could be a big kid with this guy." I didn't know there was a lot of improv in that. And it worked great because that's exactly how... there's an element of The Goonies where you like the Fratellis even though they're the bad guys, you still enjoy them. We wanted you to have that. Again, the big kid aspect of it. So you liked The Goonies overall as a role? Goonies was a fun film because it's a thing kids respond to over and over. And Bond. Bond is an iconic film. I remember that film. It was a good one. For some people, it's considered to be one of the top three Bond villains because it was closer to what they're doing today in terms of [having] a more realistic aspect. It was ahead of its time because it was dealing with the drug cartels which are in the news even today. And also Die Hard. Die Hard with Agent Big Johnson. I get all the time [people making] references to Die Hard which was again, an iconoclastic kind of film from the '80s. That changed action films. That was another benchmark movie. Absolutely. Considering you've played such a breadth of different types of characters, what are the favorite types of roles you like to play? I like a full-blooded character. Did you ever see Profiler, when I did that TV series? That was the first of its time, before Criminal Minds and CSI and all these other shows. Bailey was a pretty cool character because he had an edge to him and he was saving lives. He was a guy; he was flawed. As long as a character is interesting. Sometimes, you're frustrated because it is what it is, but you bring as much as the part allows you to bring. I wrote a new script that I'm very excited about that a big producer has optioned. We'll make an announcement in a week or so. It deals with music; it deals with what I'm doing now. I'm very excited about it. You can't tell us more than that now? I can say that it deals with the music. It deals with a singer. If The Fighter and The King's Speech were about music... it has that kind of vibe to it. Ooh. Those are both very good movies. Yeah. It has that kind of thing and they're very excited about it, the guys that are doing it. It deals with the big band music and it deals with a singer and I'm very excited about it. Are you planning more albums in the future and what type of music would you like to do? I have another album planned that will continue along these lines but I'll introduce you to an original song at that time, at the end of that one. I want to take on more of the American songbook and more of these songs and make them my own. It'll be Davi Sings Davi. Right now, I want to do this little series of songs, this tribute to Sinatra, and then take off and do originals and find new writers that are writing in this tradition. If there are any writers out there writing in this tradition, send the songs to me please because I'd love to listen to them and find those new gems. I encourage people if they're not writing in that genre, let's reinvigorate this genre and find a new American songbook that speaks to today. I encourage writers to do that. That's my quest and journey. As for film, I just did a film called The Chameleon in Toronto, a comedy. I play a parole officer that tries to keep tabs on this guy but he keeps eluding me. That sounds like you've got a full plate coming up! I have three last questions for you; these are questions we ask on all of our Culture Brats interviews. Which do you prefer: Thriller or Purple Rain? I would say Purple Rain. [laughs] These are funny questions. Did Tiffany do the balloon song? What did Tiffany do? Tell me. She did "I Think We're Alone Now." And Gibson, what song did she do? No, it doesn't help me but I'll email it to you. And the last question was two classic '80s movies: Pretty In Pink or Sixteen Candles? They were kind of similar, weren't they? Similar vibe. I just like the phrase Pretty In Pink so let's go with that. Thank you so much for talking with us. It's been a real pleasure. I appreciate you getting the word out about the album. It means a lot to me.